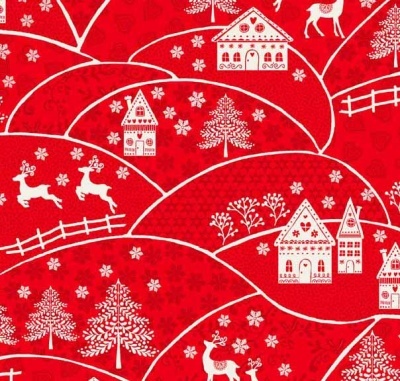 Pretty landscape hills design on a red background, 100% cotton from the Makower Scandi 2018 cotton collection. 112cm / 44" Width, this fabric weighs approximately 150gsm. Multiples of a size will be cut as one piece unless requested otherwise. Makower UK are a British company based in Henley on Thames. They're a leading supplier of cotton Patchwork and Quilting Fabrics wiith an extensive collection of solid, textured and printed fabrics.